Drivers have yet another reason to love Ford, since the 2017 Ford Mustang safety features provide an impressive amount of security measures. In addition to cushioning airbags at every important point, there are several advanced technological safety features that increase the driver’s awareness and try to prevent collisions as quickly and efficiently as possible. 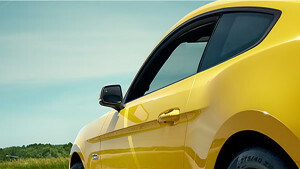 Your Mustang is even smart enough to alert you of oncoming collisions and danger. There’s more to owning a Ford than harnessing pure power. Learn more about the comprehensive 2017 Ford Mustang safety features at Glenwood Springs Ford, located conveniently near Rifle. Adaptive cruise control is leagues above typical monitoring systems, because this enhancement adjusts your speed according to traffic conditions and then returns to your original speed when it is safe to do so. You won’t have to worry about monitoring your own following distance the whole ride – your Mustang will do that for you. It’s another invaluable measure for drivers when they’re leaving the Glenwood Springs region and zooming down the highway to reach to their getaway. SOS Post-Crash Alert System™: If an accident occurs and at least one airbag is deployed, strong visual and audio alerts will be activated. Your hazards will automatically flash and the horn will sound to make your vehicle easier to locate. Securilock® Passive Anti-Theft System: The engine is prevented from starting if anything other than the coded key is used to try to start the 2017 Ford Mustang. This ensures that it won’t be an easy task to steal your vehicle. Come to Glenwood Springs Ford, conveniently located near Eagle, to test out the 2017 Ford Mustang safety features! You can find our dealership at 55 Storm King Rd. We’re open from Monday through Saturday, but you can also contact us online anytime to find out more about this equally powerful and safe sports car!